Adding living wall for outdoor design is gorgeous idea. When summer comes, seeing green plants will fresh our mind. So, living wall outdoor will boost our mood and make us feel fresh. Moreover, gain clean air. It doesn’t matter how large your outdoor space. When there are plants around, you already create pleasant outdoor design. Let it be traditional by simple furniture, but make sure you have plenty greenery. Having this outdoor reminds us about summer party. Take a look at the outdoor design with some flowers, wooden furniture, and the rug that combine in cohesive way to create outstanding view. Just invite your friends to come. You may adore to see sunset that will look awesome at summer. Apply some wicker chairs let your body to rest better. Furthermore, the porcelain tile makes this outdoor look more attractive and inviting. Enjoy every minutes of your leisure time here. Having outdoor kitchen may give you new experience. Cooke some meals for family while seeing them talking each other at the patio is great thing. This summer will give you’re an outstanding moment with your family. Can you imagine how wonderful if you spend your afternoon at this sophisticated outdoor? You will have warm conversation with your family. Furthermore, when the night comes, you can also hold simple summer party. Let us get more relaxing time outdoor at this modern seating. Summer gives you wonderful view. So, you can see sunrise or sunset every day. With sleek furniture, you will feel cozy and calm spending your free time here. 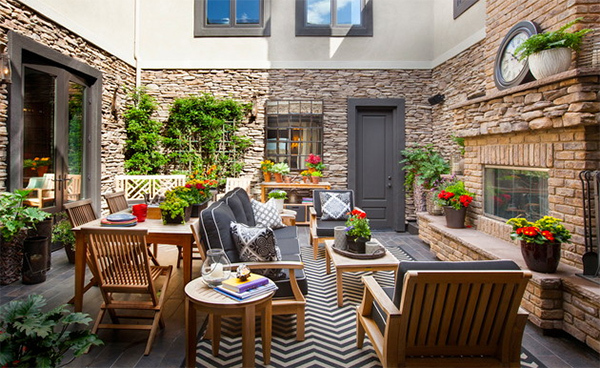 Look at the tree that gives you strong statement as the focal interest from this outdoor space decor. The role of seating will make you feel relax. Then, you see the string lights that will shine at night will upgrade your outdoor view.